Round cell sarcomas are a part of a larger group of malignant small round cell tumors which, in addition to sarcomas, includes lymphoma and blastemal tumors like neuroblastoma and nephroblastoma. They are high-grade sarcomas and are much more common in children and young adults as compared to older populations . Since they are morphologically similar and even share certain antigenic characteristics, it is often difficult to tell them apart, especially in small-volume biopsies. Molecular diagnostics and flow cytometry are useful in their differentiation . This chapter contains only round cell sarcomas. 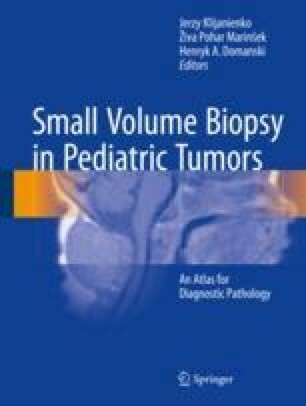 Lymphomas and blastemal tumors are described in separate chapters. Osteogenic sarcoma and synovial sarcoma are not round cell tumor; however, both have a round cell variant. Round cell osteosarcoma is extremely rare and will be mentioned together with conventional osteosarcomas that are much more common in children. Synovial sarcoma, on the other hand, occurs rather frequently in young people. Therefore, its round cell variant is included in this chapter.